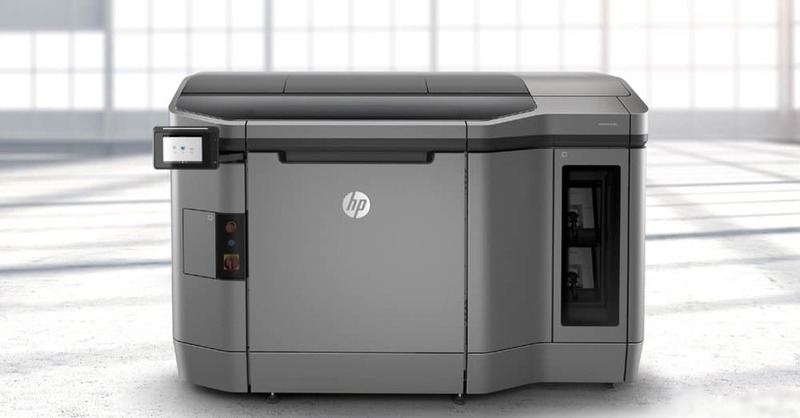 Having dominated the inkjet printer market for decades, HP was bound to dip its toes into the 3D printer market at some point. Today, we take a look at one of these attempts with the HP Jet Fusion 3D 4200, marketed as an industrial grade solution adapted to weather sustained daily usage while providing quality prints. Having got our hands on one of these bad boys, here’s everything you need to know about the HP Jet Fusion 3D 4200 and our verdict on whether it lives up to HP’s reputation for quality products. Here we go. 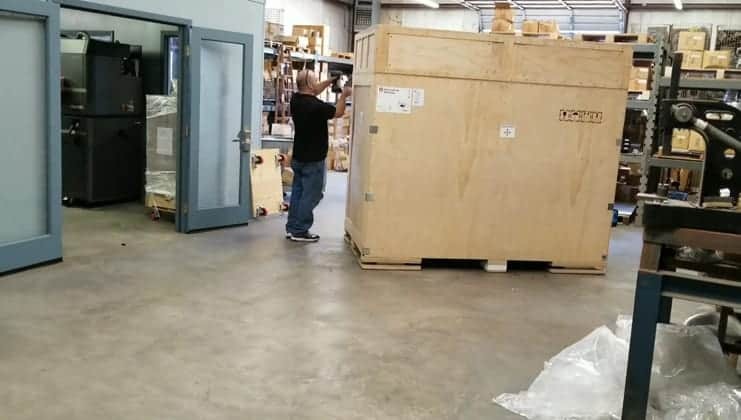 Let’s start by admiring HOW big this printer is, tallying up to an altogether impressive 2178 mm x 1238 mm x 1488 mm footprint with a total weight of 730 kg while the processing station is 2990 mm x 934 mm x 2400 mm with a load of 480 kg. 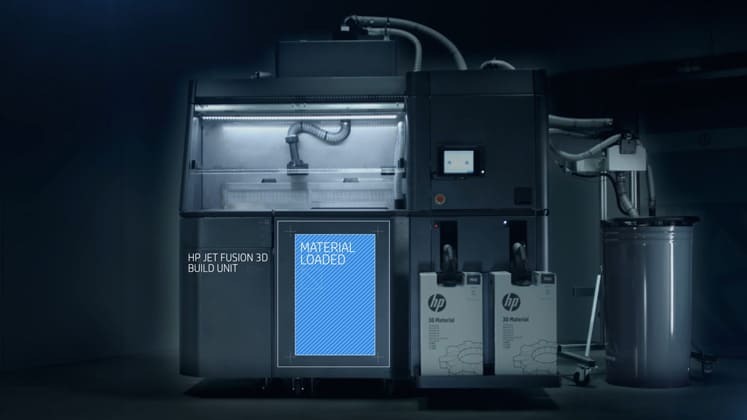 Unlike the majority of industrial 3D printers, the HP Jet Fusion 3D 4200 extends horizontally rather than vertically making it more akin to a large photocopier in terms of its physical presence. Aesthetically, it retains all the futuristic contours and functional allure we’ve come to expect from HP products allied to a beautiful dual color scheme of stylish dark gray and black. 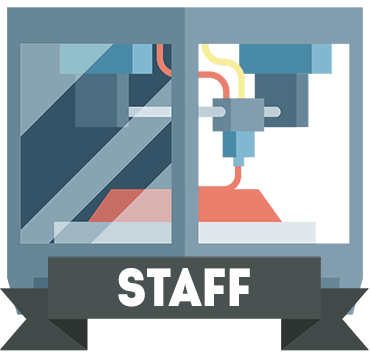 The model is effectively made up of a printer, a build unit, and processing station that when combined create an all-in-one printing solution. 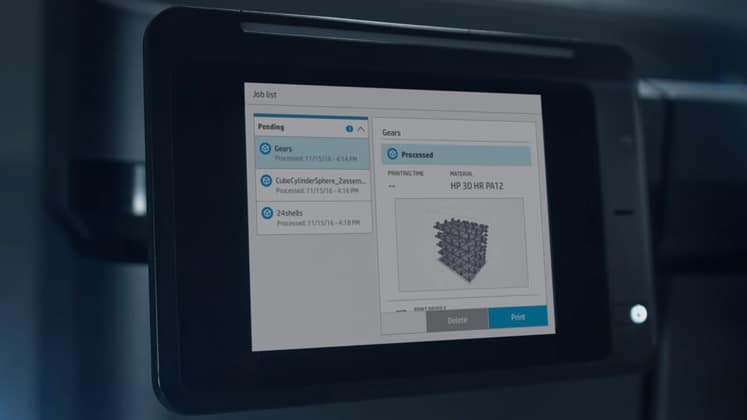 The HP Jet Fusion 3D 4200 employs HP’s proprietary Multi Jet Fusion technology, an additive printing method that uses jets to simultaneously deposit fusing agent and detailing agent voxels to melt an even layer of powder on the build bed in the shape of a model layer by layer within a fully enclosed temperature controlled chamber. An infrared lamp/heater passes across the surface of the bed selectively fusing the powder to the layer underneath. Completed layers are then lowered to make way for the next and so on. In practical terms, there are three global steps to using the HP Jet Fusion 3D 4200. 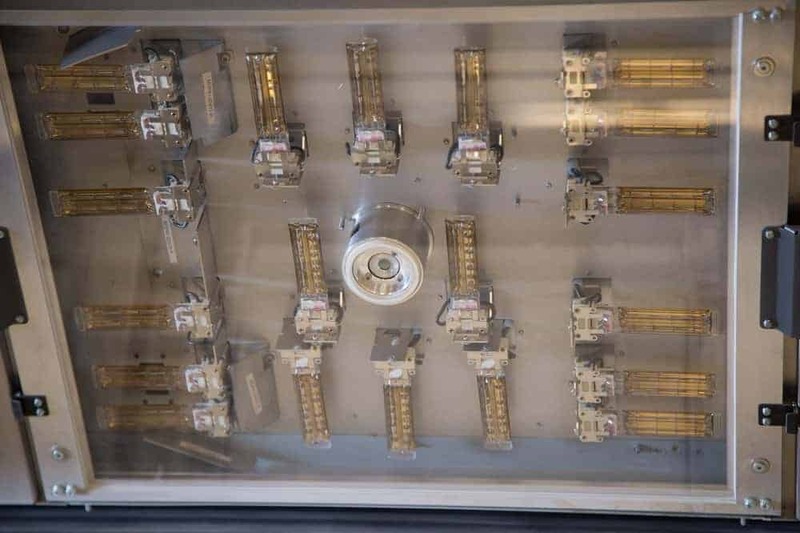 First, the mobile build unit inserts into the processing station where defined quantities and levels of materials are automatically mixed and loaded into a tank inside the build unit. The build unit is then transferred to the printer where the Jet Fusion process creates the model. 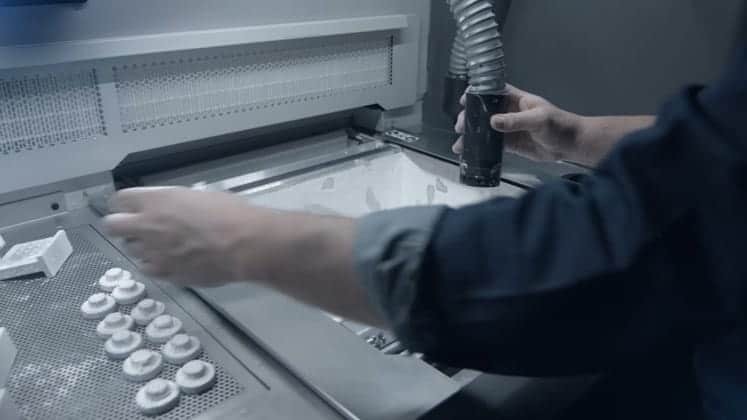 Once the printing process is complete, the build unit is transferred back to the processing station where finished models are cooled, unpackaged, and cleaned of excess powder. The printer has two build units to produce prints uninterrupted. Process aside, let’s look at some specifications. 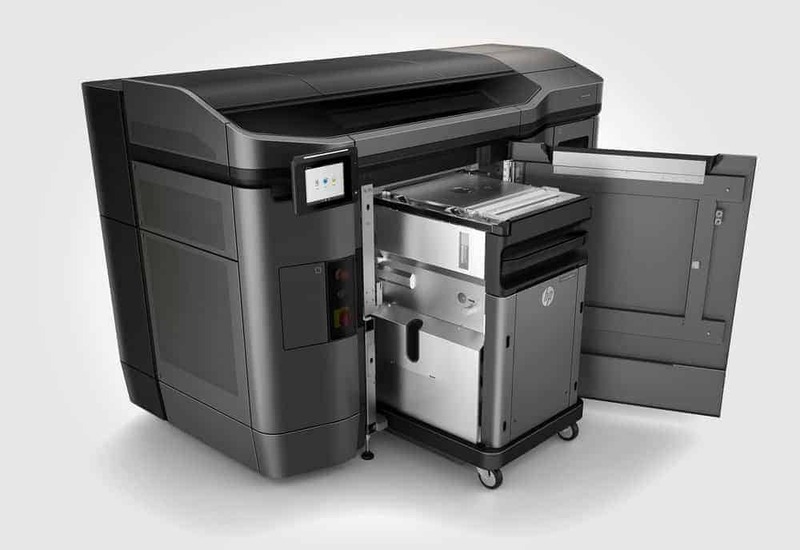 The HP Jet Fusion 3D 4200 has a build volume of 380 mm x 284 mm x 380 mm with a maximum layer thickness of 80 microns, a print resolution of 1200 dpi, and build speed of 4115 cm3 per hour. 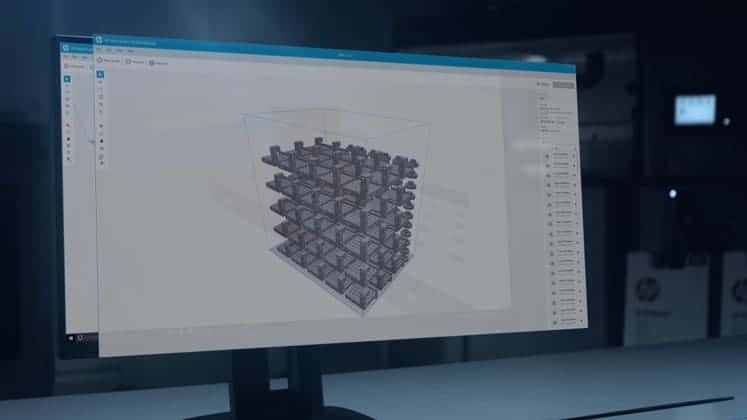 Connectivity is assured through Gigabit Ethernet for network use, and USB flash drive, alongside HP’s tandem of SmartStream 3D Build Manager and SmartStream 3D Command Center software with support for 3MF, STL, OBJ, and VRML file types. Additional features, include constant quality monitoring via the touchscreen (the touchscreen has an eight icon display running the gamut of settings and monitoring options) throughout the printing process to minimize mistakes, excess powder recycling, and the ability add new parts to a print already in progress. Material support is limited to HP products; HP 3D High Reusability PA 12, HP 3D High Reusability PA 12 Glass Beads, and HP 3D High Reusability PA 11 shipped in three-liter boxes that sit alongside the processing unit. Colors are currently limited to grey with plans to expand soon by working with third-party material manufacturers. Due to its voluminous size, the HP Jet Fusion 3D 4200 ships on a massive encapsulating wooden crate for protective reasons. Removing the container is a four-person job and takes time. In most cases, the point of purchase will offer unpacking services to do just this. Fortunately, all three units are fitted with wheels for easy maneuverability once the packaging is removed. Installation is complicated and best left to trained technicians or in house tech teams and includes wiring, part installation, and the like. As a printer designed for volume alongside a sustained and predictable level of quality, the HP Jet Fusion 3D 4200 performs as expected; systematic high-quality prints fit for purpose with no errors or manufacturing inconsistencies. The parts we produced were perfect for high-level prototyping, end-user products, and everything in between. Seeing the Multi Jet Fusion technology in action is impressive with an almost hypnotic back and forth between the layering of powder and the sweep of the halogen lights. The only real gripe was the lengthy cooling period for the materials, which although aided by the processing station’s cooling mechanism was more prolonged than other additive techniques we are accustomed to and found in competing industrial level 3D printers. The issue is, however, offset by the sheer detail and impeccable quality of the prints. The software is remarkably well designed for a proprietary product with an intuitive slicer-like preparation phase alongside error checking features that help the process immensely. HP is stressing simplicity to maximize productivity with a helping hand at every turn. 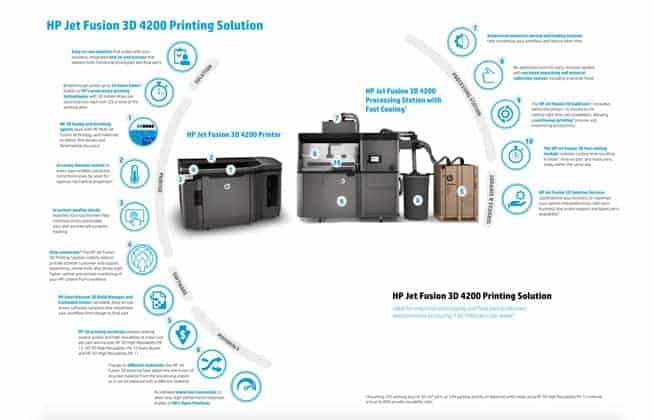 As for long terms costs, one of the core concepts behind the HP Jet Fusion 3D 4200 is prolonged affordability, and this is seen in smart money-saving features such as the ability to reuse powder, maximize production via the dual build unit setup where the processing station and printer can work continuously to create prints. The error monitoring system also ensures no prints end up botched or unfit for purpose. The initial cost of buying the printer is balanced out by the ongoing cost-effectiveness of production. 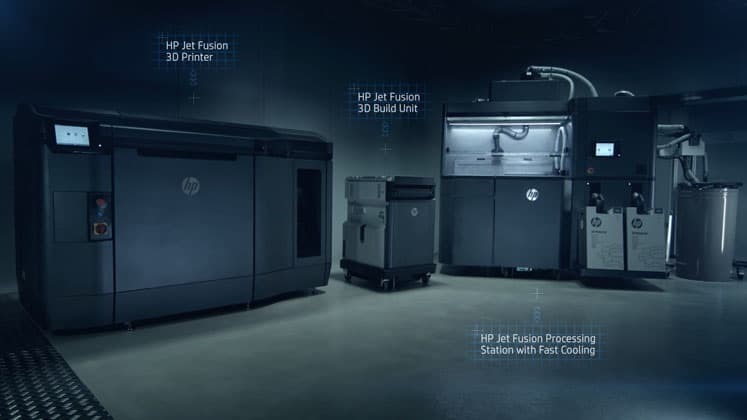 HP offers a one-year warranty for the Jet Fusion 3D 4200 with the possibility of paying for extended warranties with servicing options with on-site support and maintenance. Customer support adheres to the standard set by other HP products with a dedicated technician phone line and a wealth of guides, tutorials, and videos on the company’s web site to aid with any troubleshooting, operational, and general maintenance issues. The HP Jet Fusion 3D 4200 is expensive. There’s no circumnavigating this fact. As such, it is uniquely suited to large scale professional operations that have the capital to invest in such a costly device. 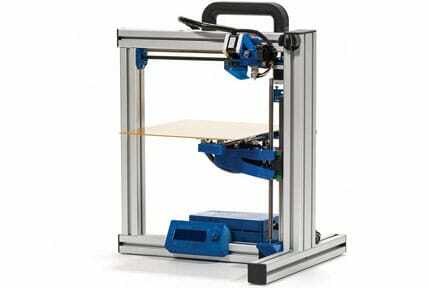 Cost aside, we are hard pressed to find a better model within the industrial 3D printer market. The quality of the prints, the ease of use, the strength and variety of the materials, and the all-in-one solution combine to make the Jet Fusion 3D 4200 one of, if not, the best 3D printer on the market today. Thomas is a journalist based in the United Kingdom with a huge passion for gaming and technology. 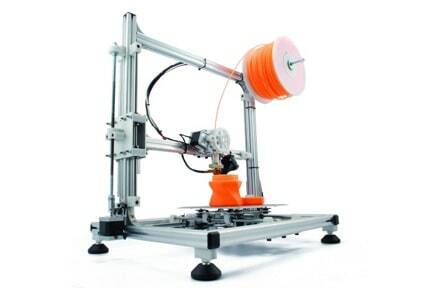 He uses his deep research skills and experience to review 3D printers here at 3DBeginners. A refined workhorse, the HP Jet Fusion 3D 4200 is among the best printers we’ve ever used. HP have delivered a versatile, if expensive, industrial printer that churns out perfect prints in an intuitive and professional package.